Azure Functions are Microsoft’s answer to Amazon’s Lambdas or Google’s Cloud Functions (aka “serverless” architecture). They give you a way to deploy small pieces of code, and let Azure handle the underlying server. I’ve never used them before, so I thought I would give them a try beyond “Hello, World”, by getting them to work with Couchbase Server. There are more options in Azure Functions beyond simple HTTP events (e.g. Blob triggers, GitHub webhooks, Azure Storage queue triggers, etc). But, for this blog post, I’m going to focus on just HTTP events. I’ll create simple “Get” and “Set” endpoints that interact with Couchbase Server. Once I had this tooling in place, all I had to was to File→New→Project. Then under “Cloud”, select “Azure Functions”. Once you do this, you’ll have an empty looking project with a couple of JSON files. Right click on the project, add item, and select “Azure Function”. Next, you’ll need to select what kind of Azure Function you want to create. I chose “HttpTrigger”. I also chose “Anonymous” to keep this post simple, but depending on your use case, you may want to require an authentication token. After you do this, a very simple shell of a function will be generated (as a C# class). 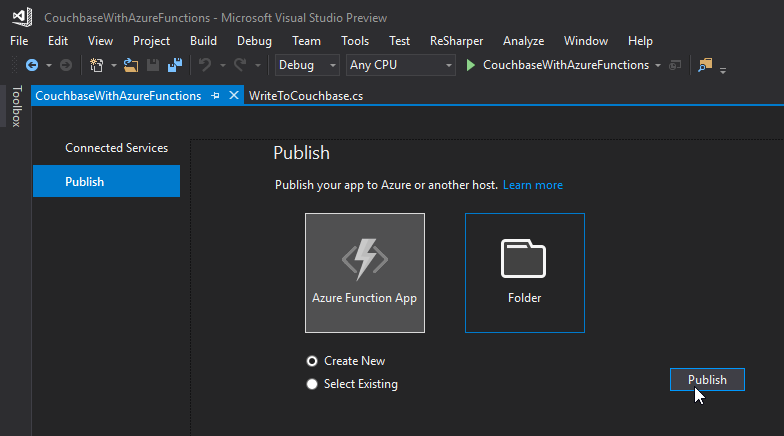 You can execute this function locally (indeed, that is what the local.settings.json file is for) so you can test it out without deploying to Azure yet. Currently, if I do that, I’ll get “null” as a response (since I don’t have any validation or error checking code). So let’s move on and create a “Set” function. The “Set” function will be slightly different. I want document information POSTed to it, and I want it to return a message like “New document inserted with ID 123456”. Now, when I POST that to the endpoint, I’ll get a response message of “New document inserted with ID f05ea97e-7c2f-4f88-b72d-19756f6a6f35”. When running Azure Functions locally, this file is used for configuration. 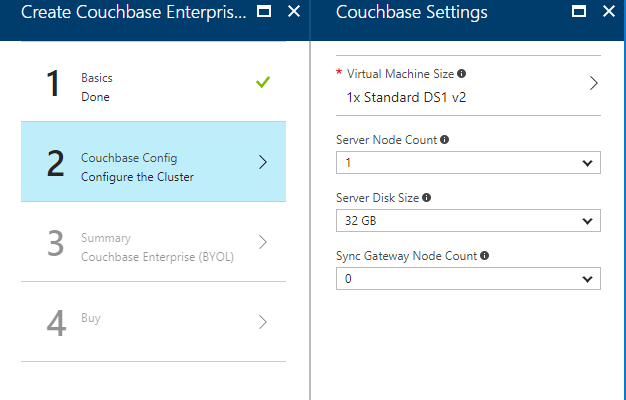 I have Couchbase Server running locally with a bucket called “azurefunctions”. Anything in “Values” can be accessed via Configuration.AppSettings. Once the cluster is created, find the URL for the first node in the cluster (just as demonstrated in the above video). My URL looked something like: http://vm0.server-hsmkrefstzg2t.northcentralus.cloudapp.azure.com:8091. Go to this URL, login, and create a bucket (I called mine “azurefunctions”, just like I did locally). To begin, right-click the project in Visual Studio and select “publish”. You’ll need to create a new publish profile the first time you do this, but that’s easy. Click “create” and these items will start to be created in Azure (it may take a minute or two). 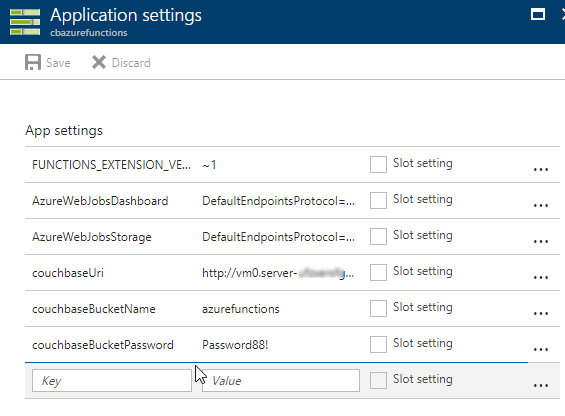 In the Azure portal, navigate to the Azure function (I called mine cbazurefunctions), and then select “Application Settings”. Under “App settings”, enter those three settings: couchbaseUri, couchbaseBucketName, and couchbaseBucketPassword. Authentication – I used anonymous Azure Functions to keep it simple. Azure Functions can also provide authentication tokens to use that prevent access except to authorized users. App settings – Setting them manually in the portal may not be the best solution. There is probably a way to automate that portion. HTTPS/TLS – You will likely want to have some level of encryption as you are getting and posting data to your Azure Functions. The above example transmits everything in clear text.